Swimming by our campsite on Isabella Lake in northeastern Minnesota early on a June evening was this new family of mallards. Of the 10 little fuzzballs, there was one inquisitive one that strayed away from the rest of the brood in his quest for a water spider. One loud quack from mom and he was back with the family. The hens are generally very protective of the ducklings, straying too far from the brood could mean getting lost or an easy meal for a turtle or a large fish. 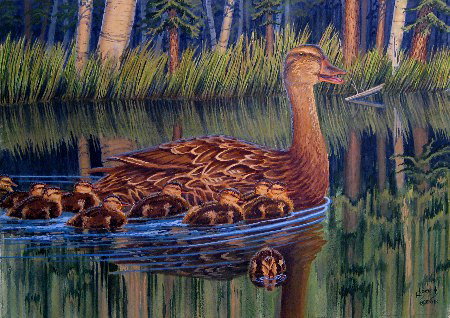 The ducklings grow at an amazing rate, much of their protein diet coming from insects.